Eye tracking opens up a wealth of new intuitive interactions between man and machine. Powerful computer chips, highly efficient and miniaturized infrared LEDs in combination with modern camera sensors now make it possible for previously complex eye-tracking systems to be adapted for consumer applications. For decades the keyboard and the mouse have been our traditional tools for operating computers. With the rise of mobile devices, touchscreens became a key technology, making today’s electronic companions more user-friendly and also catering to the miniaturization trend which has eliminated traditional operating hardware for small scale gadgets. The addition of speech recognition made our interaction with technology – from mobile devices, navigation systems to smart home gadgets – even more intuitive. So what is the next step in human-machine interaction? After reacting to a light touch or voice commands, the technological development now allows more and more devices to anticipate a user’s intention by tracking his gaze. Eye tracking systems register an observer’s point of gaze as well as his or her eye movements. The systems illuminate the eyes with infrared light and register the reflections with a camera sensor. Software determines the position of the pupils and the direction of gaze. As humans primarily use vision to navigate their environment, the eyes can reveal volumes about what’s happening in the user’s mind. They can tell a device what the user is focusing on and how they’re responding. The method has already been used in specialized systems for several decades. Medical support devices e.g. allow paralyzed patients to operate wheelchairs and communication tools with their eye movements. Another example is the use of eye-tracking systems in special equipment for consumer behavior research. Until recently however these systems have been too expensive, complex and space consuming to make their way into the mass market. With the miniaturization of key components, such as extremely compact but also powerful infrared light emitting diodes (IRED), developers can finally integrate eye tracking technology into more and more consumer products. The latest IREDs of Osram Opto Semiconductors’ Synios series – SFH 4770 and SFH 4771 – have a footprint of only 2.75 mm x 2.00 mm x 0.6 mm. Both products operate with a wavelength of 850 nm and can be used for applications in which the device is utilized in close range to the user. For this application field a low power class is sufficient, making the technology extremely energy efficient. The compact size, and because the two products have no optics, allow for much more flexible design options. Both products feature a low profile, small footprint and best in class radiant flux. At an operating current of 1 A the SFH 4771 features a radiant flux of 700 mW and a radiant intensity of 230 mW/sr. At 1.5 A the SFH 4770 has a radiant flux of 870 mW and a radiant intensity of 350 mW/sr. Smartphones and tablets with eye-tracking functionality have already been demonstrated. The benefits of the technology however become most apparent in applications where fast reaction times are key or in which an organic interaction adds to the user experience – such as gaming or virtual and augmented reality. Today, over 100 gaming titles already include eye-tracking support and top-tier companies have collaborated closely to bring the benefits of eye tracking to a wide range of gamers and eSports audiences. The technology makes the interaction faster and more intuitive. When done well, these systems can also enable virtual displays that respond to natural, even subconscious, cues from the user, creating a truly immersive virtual experience. 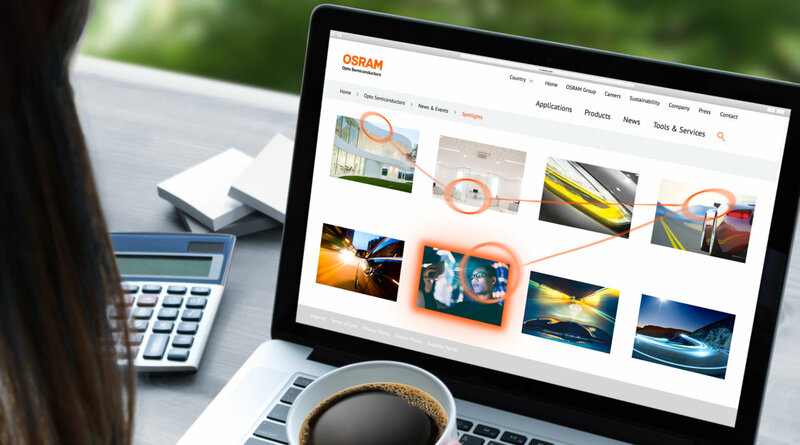 With this latest addition to the infrared portfolio for eye tracking solutions Osram Opto Semiconductors has expanded its broad portfolio of high power IREDs to cater to all application requirements. © 2019, OSRAM Opto Semiconductors GmbH. Alle Rechte vorbehalten.